What Makes Good Landscape Photography? I was recently asked to help judge a photography exhibition. Some of the work was spectacular, full of emotion and life. Others, not so much. So what makes a good image? I’ve been asked this question many times, and this recent experience gave me pause to think about the topic a little more in-depth. So I figured I’d share my thoughts on the subject and solicit other opinions as well. And for this exercise, I’m primarily referring to landscape and skyline photography. – correct or intended focus and sharpness…. This can include a range in depth of field from a single focal point to a sharpness from the foreground to the far distance. 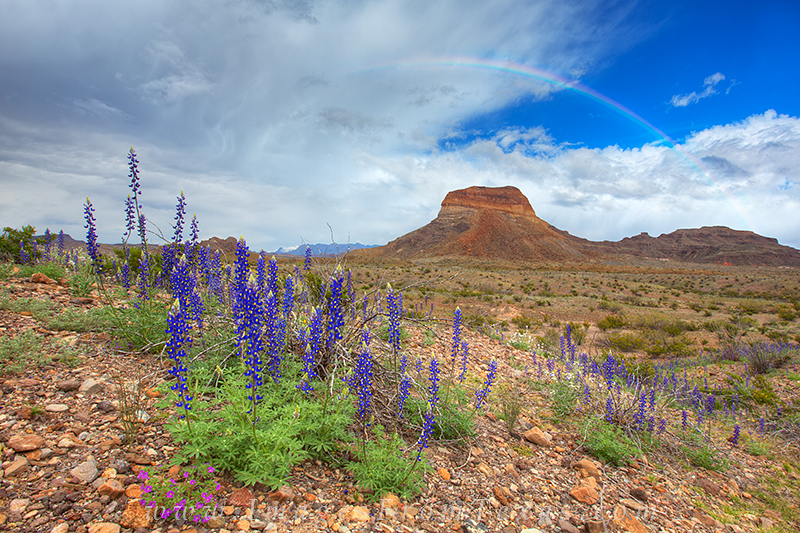 – the subject of the image should be obvious, whether a single object such as a bluebonnet or a vast Texas landscape like the Chisos Mountains. – leading lines… This is very important for me. I like line, angles, curves, and anything that leads the eye to guide me to the subject. I also want those lines and angles, whenever possible, to intersect with the corners of the image exactly. These lines could be composed of roads, water, buildings, rocks, and anything that allows the eye to flow. 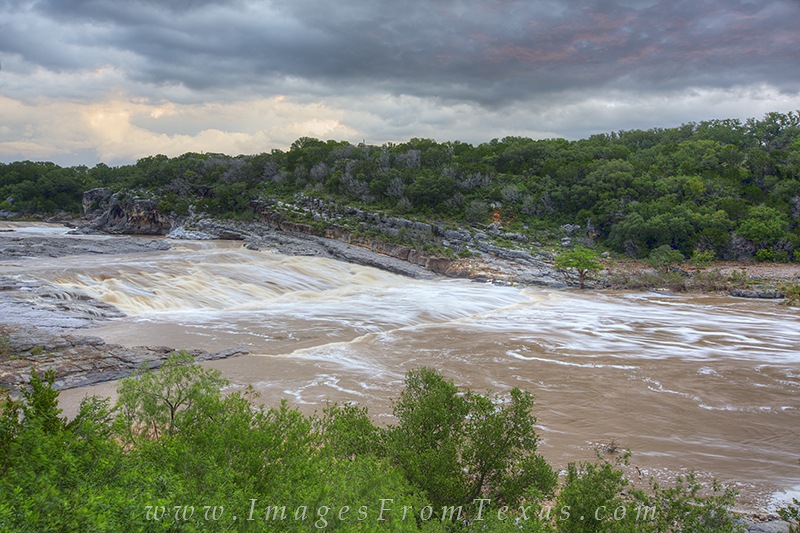 One of my favorite stretches of river in Pedernales Falls State Park is this small cascade. 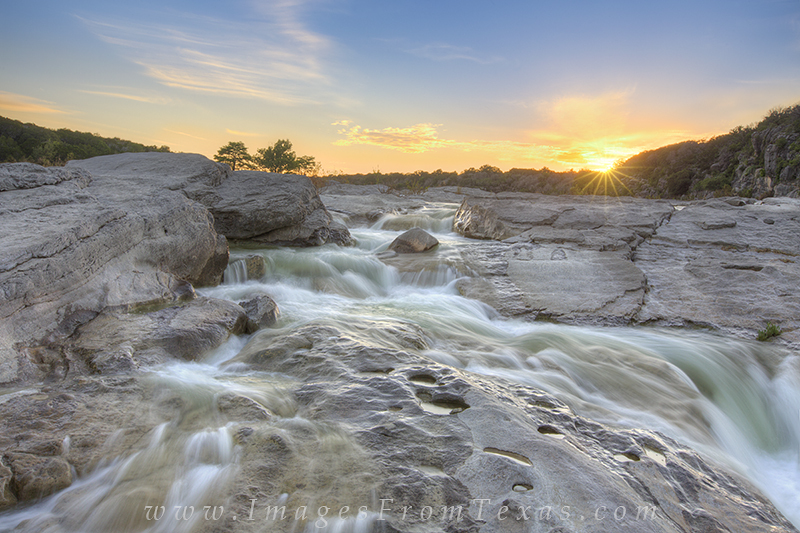 If rains have fallen recently, the river creates some small and beautiful falls that glide over the limestone rock. 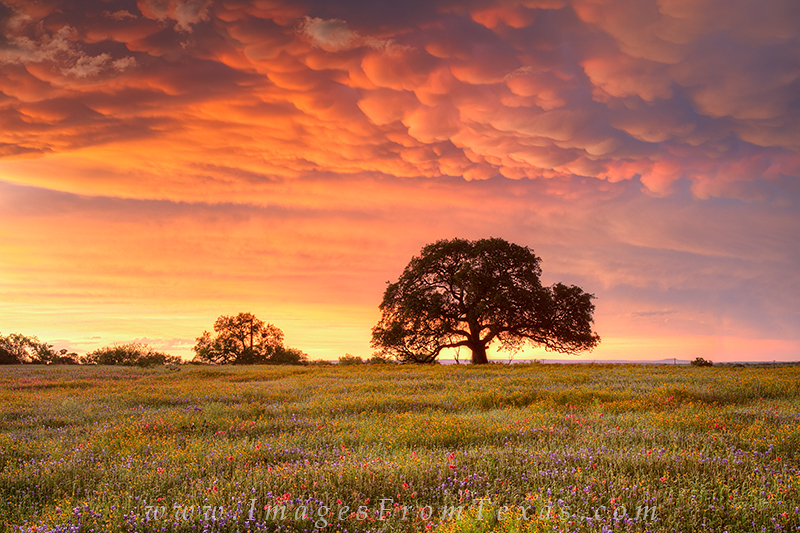 This image from the Texas Hill Country is a composite of several photographs. 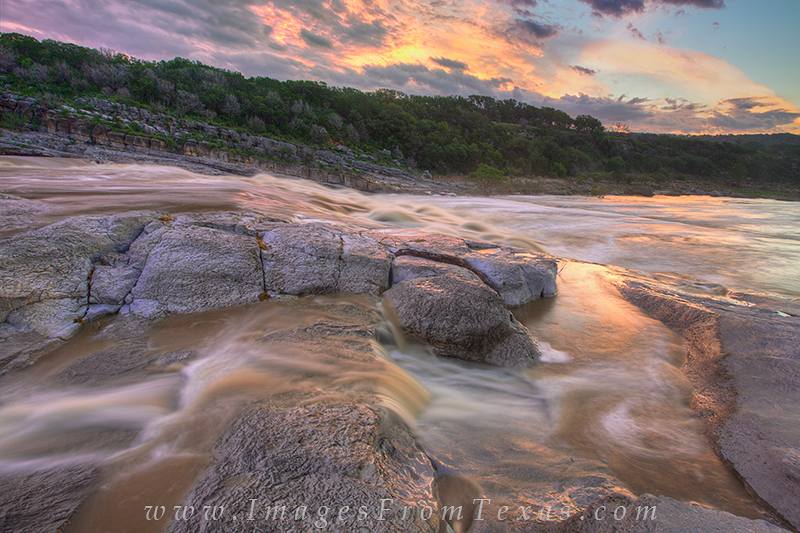 One image was a long exposure using a heavy filter to create the ribbon-like qualities in the flowing river. The other exposures helped control the differences in the light of sunset. All were blended together to create this small moment of a peaceful summer evening. Within the composition of an image, I look for elements that make up a scene. – first, unless I’m going for a minimalist approach, a sky with good, if not dramatic clouds, is a must. I shoot mostly at sunrise or sunset and always hope for pleasing colors, but even a nice blue sky with high wispy clouds can be pretty nice and can complement a nice foreground, often making an average image much stronger. I also always know when and where the moon will appear. Often, the appearance of our moon can enhance an otherwise dull sky. – foreground element(s)… When I photograph a field of bluebonnets, I really like to have a few of the flowers up close to show the detail. For this, I’ll often shoot several images for varying depth from front to back and blend them together on photoshop. Other foreground elements could include rock formations, trees, logs, and even silhouetted people. 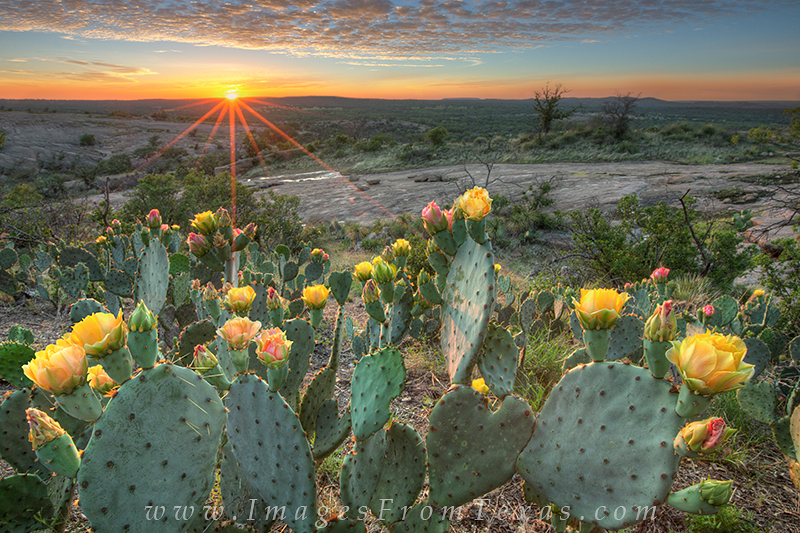 – background elements… In most cases, I want a sharpness throughout the scene, especially for those vast Texas landscapes. I want folks to see what I saw and feel the wonder of the scene. When all of these factors are taken into account, you have potential for a strong image. That being said, the most important aspect of a photograph is the impact it has on the viewer. Does it capture your attention? Does it make you pause or think “wow.” Does it tell a story? It can be technically perfect, but if the image leaves the viewer void of emotion, it loses its impact. In my recent experience of judging photographs, I saw several images that showed superior planning and execution, but came away feeling nothing. Conversely, some of my highest scoring images had minor technical or compositional issues, but left me gazing longer, wanting to know more about the story being presented. Emotional appeal – or impact – makes or breaks an image. I like to think I practice what I write. And I know some of my images come up short. But many times what I think are average photographs turn out to be best sellers. The images I like the most barely get a second glance. So no matter what anyone says, if you enjoy photography, keep on shooting. Unless you are utterly daft at the point and shoot, you’re sure to appeal to someone! 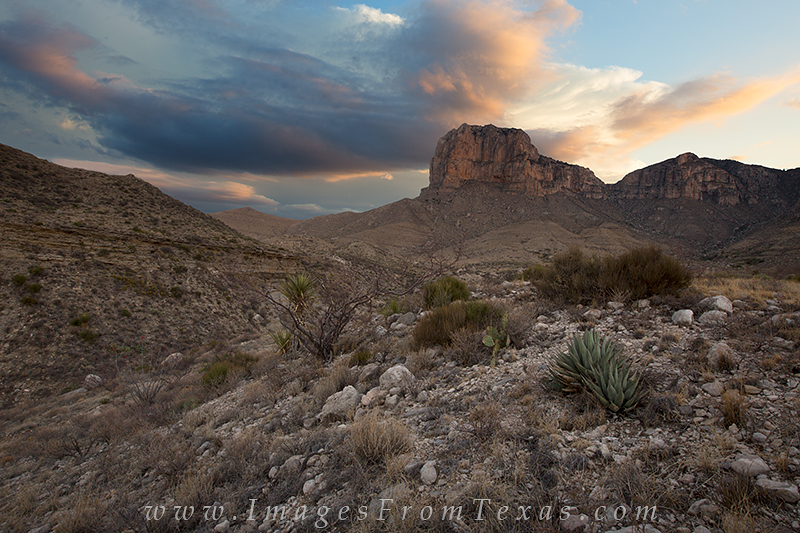 Feel free to visit my website at Images from Texas. Follow my travels on Facebook, as well. 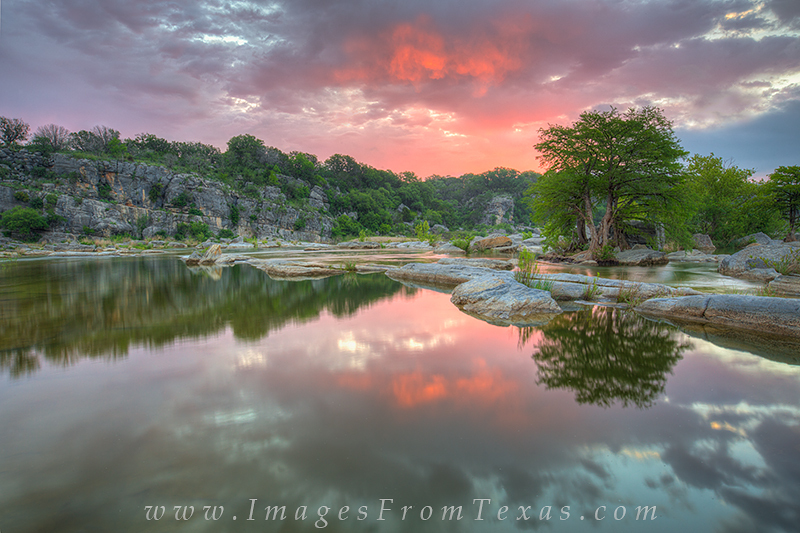 Posted in Texas Landscape Images and tagged images of texas, texas landscape photography, texas landscapes, texas photography, texas prints on June 27, 2015 by Rob Greebon. Far from my home in the Texas Hill Country, there is a swamp full of cypress trees, snakes, and alligators. I’d never visited Caddo Lake in the east Texas wetlands until last week, when I had the opportunity to photograph the area. A few friends who are part time residents in a tiny town called Uncertain offered a room and their services as a boat operator/tour guide. After several months of talking about it, I finally had the time to make the 6 hour drive and hang out for a few days. 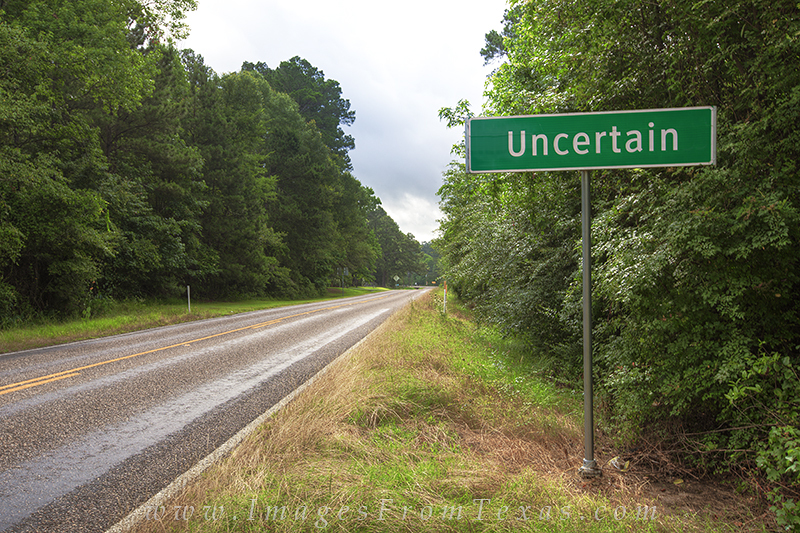 Uncertain, Texas, is a small town on the shores of Caddo Lake. 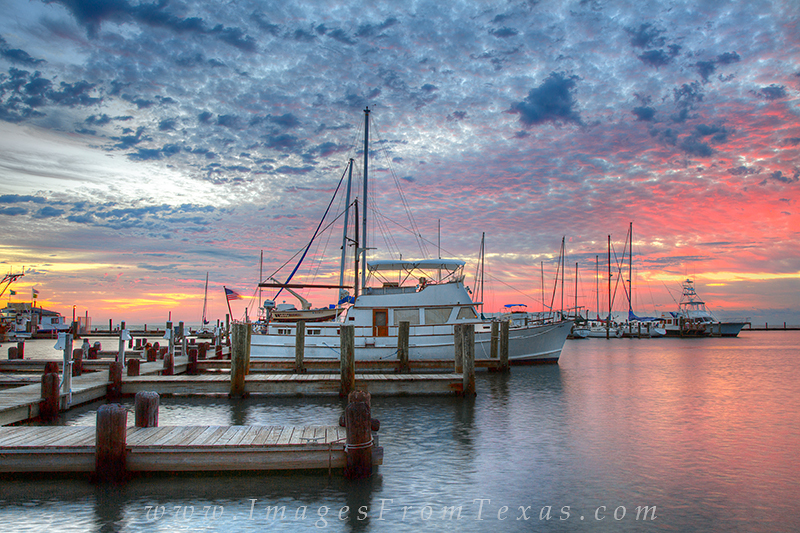 The economy is based mostly on tourism – hunting, fishing, and boating. The days are humid, quiet, and life is good. 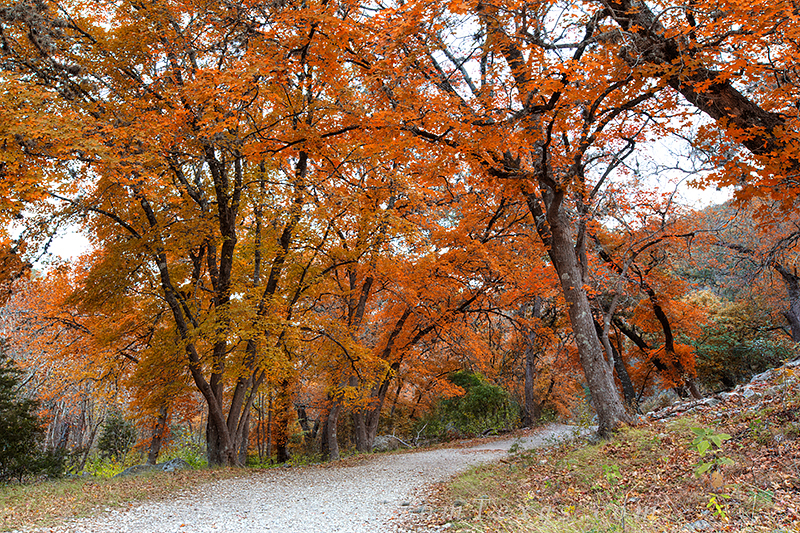 East Texas, and certainly the area around Caddo Lake and Caddo Lake State Park, offer quite a different lifestyle than does the hill country. It seems everyone either owns a boat or has access to a boat. I think there is a church at least every half-mile of highway, and most residents have a rocking chair somewhere in the front yard or on the front porch. From this vantage point, they smile, wave and watch the world go by. Besides the uniqueness of Caddo Lake, I also saw or experienced a few things for the first time. I saw a car towing (with a rope) a motorcycle. A guy was riding and steering the motorcycle. Both were pulled over by a police car. I tried fried alligator for the first time. I saw wolf spiders bigger than my hand, and I navigated through swarms of mosquitoes so thick I had to cover my mouth for fear of ingesting them. Still, the trip was amazing. The cypress forest that sprawls across the 25,000 acres of swamp makes up the largest cypress forest in the world. The trees dripped with Spanish moss, often times resembling a fairy tale scene. On the boat, we weaved in and out of narrow passageways, through cypress and around stumps, (with me) always hoping to see an alligator. Alas, the only alligator I saw was battered and deep fried. I also kept an eye out for Bigfoot, but never saw one. (Several hundred Bigfoot sightings have been reported in this area since 1965 according to the Bigfoot Research Organization). One section of the bayou was called the Cathedral, where the 90-feet high cypress trees leaned in across small back-alley of water. The way through this section was dark and mysterious. 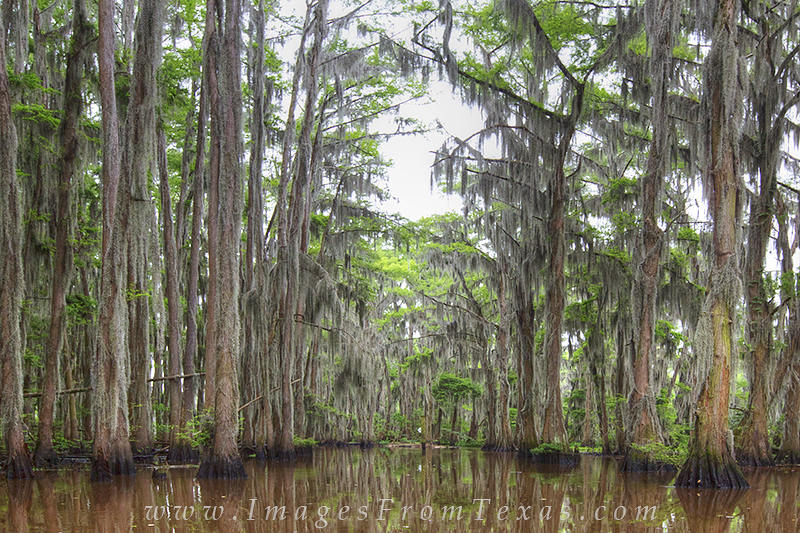 On a stretch of bayou on Caddo Lake, cypress trees rise high and arch over the murky water below. This area of east Texas wonder is called ‘the Cathedral’ and welcomes visitors – almost always in boats – with a long tunnel of trees. The scenery is breathtaking and mysterious, and the drift through this section of the lake is not soon forgotten. 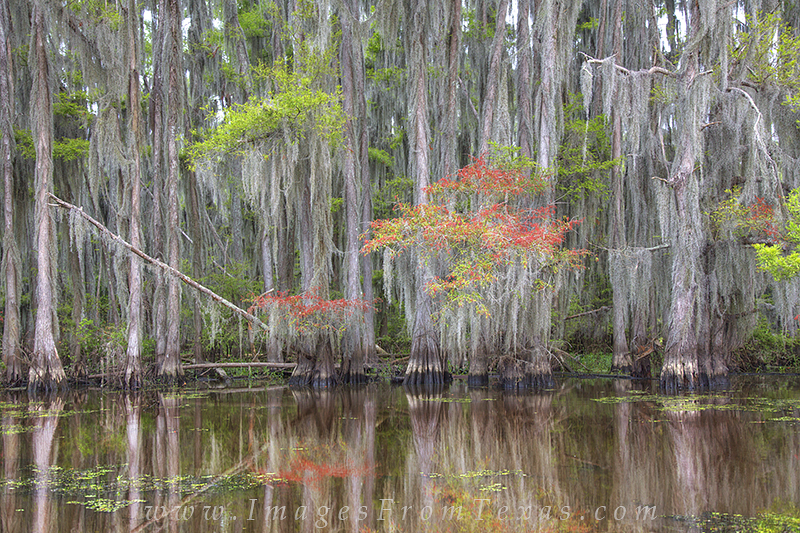 On a stretch of bayou on Caddo Lake, cypress trees rise high and arch over the murky water below. This area of east Texas wonder is called ‘the Cathedral’ and welcomes visitors – almost always in boats – with a long tunnel of trees. The scenery is breathtaking and mysterious, and the drift through this section of the lake is not soon forgotten. On one evening, the sunset was simply beautiful, and I had the good fortune of using a friend’s duck blind to stabilize the tripod to capture the waning light of day. The colors of fading sunlight emblazened the sky over Caddo Lake in a palette of orange and blue and gold. The day had been mostly overcast, but when a few breaks in the clouds appeared just before sunset, a friend and I headed out on the lake and found a place to stabilize a tripod and capture this amazing end of the day. I should note here that photographing this area proved challenging. I tend to shoot 99% of my photographs using a tripod. However, you don’t have this luxury around the lake because there is no land. Shooting from a boat in low light is difficult if you want to produce high resolution images that lend themselves to large prints. You really have to crank up the ISO (I had to put it on 1000 several times) just to obtain a fast enough shutter speed to have a chance to produce a sharp image. Many times, there was still too much movement in the boat. I do have plans to return and I’ll have a different strategy! One option is shooting from the fishing pier at Caddo Lake State Park. This little wooden dock offers good views for both sunrise and sunset, but not much in the way of unique perspectives. Still, it is a start. 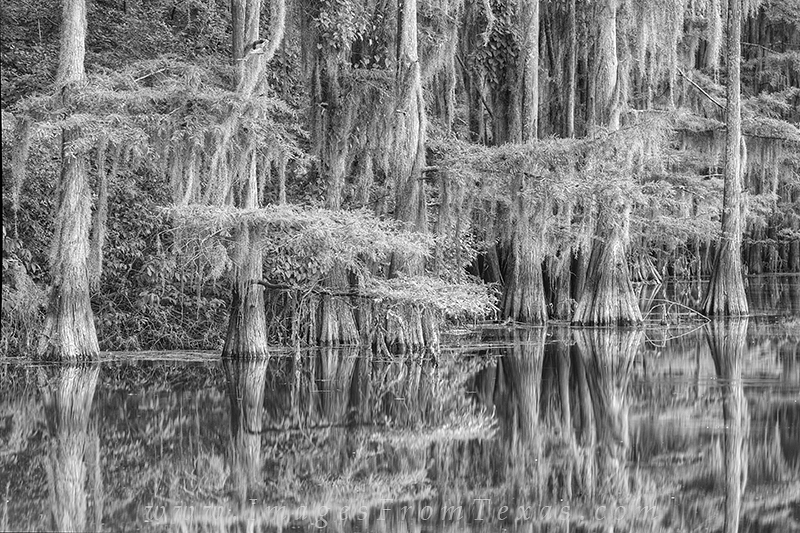 Cypress trees draped in spanish moss rest along the shores of Caddo Lake. This image, taken at Caddo Lake State Park, captures the reflections of these stately trees in the calm waters at sunset. I enjoyed my time here, and I do look forward to returning soon. Before that, though, I have a few other places and adventures planned. 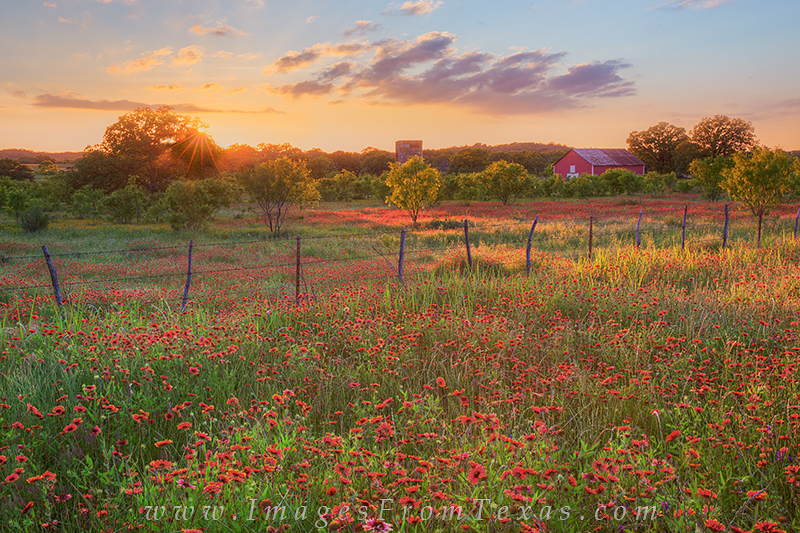 In the meantime, enjoy the rain, Texas! Follow my travels on my Facebook page. 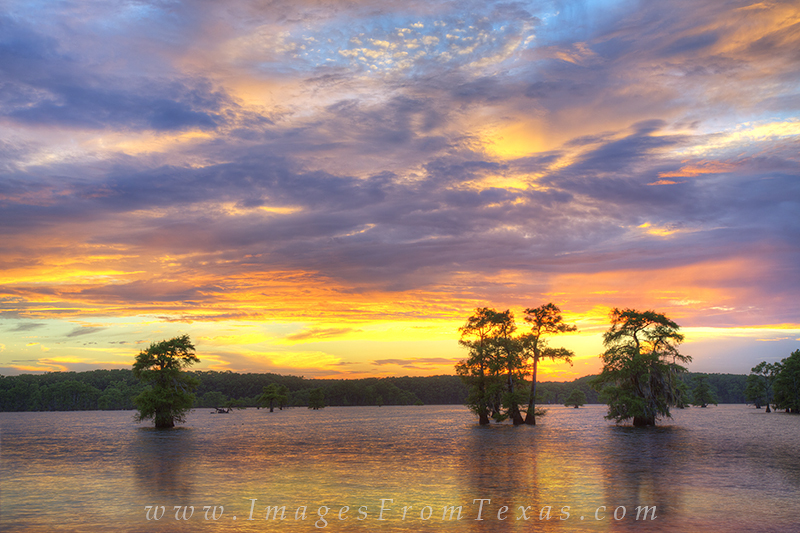 Posted in East Texas and tagged caddo lake, caddo lake images, caddo lake prints, caddo lake state park, east texas images, east texas prints on June 18, 2015 by Rob Greebon.